Eccentric Butlers who spread the wonders of British etiquette everywhere they go. A fine walkabout act, with a stiff upper lip, a touch of class and a large measure of eccentricity. 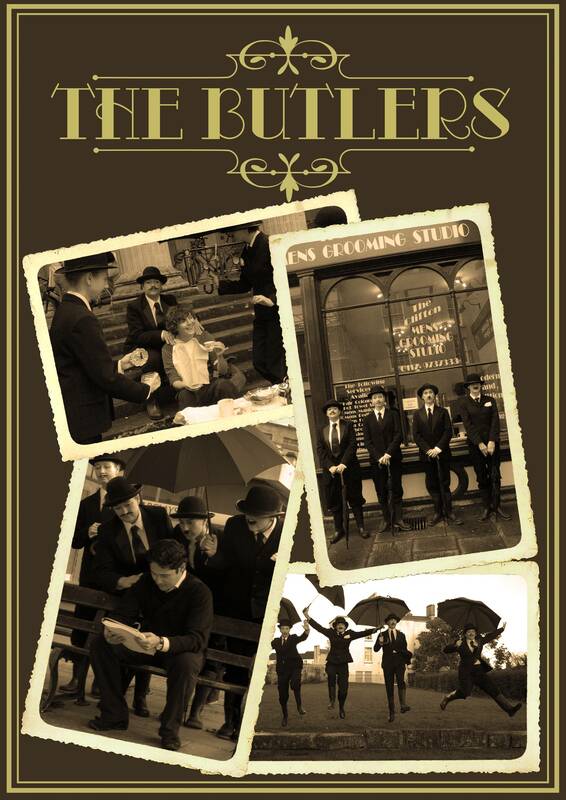 These silent movie style chaps go about their duties, giving good grooming, firm handshakes, both formal and informal introductions, newspapers, relaxing massage and umbrella cover should the British weather encroach on the proceedings. If you’re lucky they will perform their constitutional eccentric dance. A true wonder to behold. Think Monty Python meets Upstairs Downstairs! Perfect for comedy meet and greet, installation and equally at home as a walkabout. They can go anywhere as long as they can provide their marvellous services to Sir or Madam. From 2 – 5 performers. Three upwards recommended. Great for abroad as no language. Cheap and easy to fly as costumes are small and big props not necessary.